Double Dutch Design is the customized lingerie brand for cup D+, with the ease of a web shop and the advice of a specialized lingerie store. Our secret is a combination of old-fashioned attention to detail and the use of modern technology. Double Dutch supports women. Not only by giving women a comfortable bra, but also by donating a prosthesis bra for every 50 bras sold. So with every bra you buy, you support another woman. 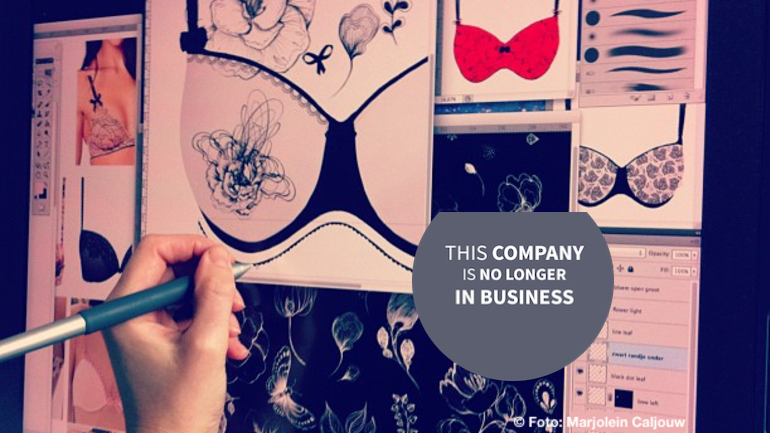 Double Dutch Design wants to revolutionize the lingerie industry! How? - Invest € 60 or more: Coupon for a free set of Double Dutch straps in a color of your choice. Invest € 100 or more: The Double Fun package! You'll receive a boxershort in the same print and color as your girlfriend / wife's DDD bra! Invest € 100 or more: The Double Hipster package! You'll receive a soft hipster or string in the same print and color as your DDD bra, or as your boyfriend / man's boxershort! - Invest € 1000 or more: You will join an exclusive brainstorm session at Double Dutch headquarters where you participate in choosing the bra designs of next season! Double Dutch is a Dutch fashion start-up. We have the goal to give every woman her ideal bra. We don't believe in the mass-production model but in quality and in Dutch Design. In order to reach a perfect fit, we have designed our own ‘cup’ that is included in each bra. In order to compete with other brands on design, we make use of digital technology to provide customization. In each shop we have one bra of each size, so customers can try out the right size. They can then order a customized bra, in the design and colors they need. This is a form of modular customization: the parts are already produced but the final bra is designed on demand. This is a new and Lean business model that is harder to implement for large, established shops / chains. - Customers can create a bra in their personal style. - Use of social media to enquire about favorite designs and colors for the upcoming season. - Customers can order first before the bras will be taken into production: risks of return are low. - Dutch designers create prints for the bra. Only the prints most customers like, will be taken into production. This way, real fashionable bras are created following actual requirements of customers. - Women need professional advice: partnerships with physical lingerie shops are being created in all parts of the Netherlands. - One bra in each size is available in the shop and women can fit the bra in the presence of specialists . - After the fitting, women can purchase the bra in the desired colors and with the requested features via a tablet computer in the store. By this way, an extensive group of potential customers will be reached at low cost. - Repeated purchases are very covenient both via the internet and in the lingerie stores. - The lingerie stores will receive commission for every bra sold, even when the first bra is sold at their shop and that same customer buys her next bra online. All over the world, the average ’breast size of women is growing whereas larger sized bras are needed. In Europe, the average bra size increases rapidly. Around 15 years ago the average bra size was 75B and in 2010 this increased up to 80C. Today, 30% of the women in Europe have cup D or a larger size (Source: www.nu.nl, 2013). With regard to bra size, Dutch women count for a third place in Europe. The average size in The Netherlands in 2013 was D cup, and 33% of Dutch women has a D cup or larger (Source: www.Brasize.com, 2013). 1. Product life cycles in the women’s lingerie industry are becoming shorter, while demands for innovative products in a variety of styles, sizes and fabrications are increasing. 2. The women’s lingerie industry is growing, yet its consumer base requires both fashion-forward merchandise as well as products that fit comfortably for women. Double Dutch tackles the problems and fulfils the market need by facilitating a customized lingerie shop with the ease of a webshop and the advice of a specialist lingerie shop. Double Dutch targets the 33% of the Dutch market of women with cup D or larger. This comprises of approximately 2,3 million women in the age of 15 year and older in The Netherlands (Source: CBS, 2011) (Appendix 1 lists the average bra size per country). In the first year, women with a D - G cup and a waist line of 60 - 85 cm are being served. In the subsequent year, other sizes shall be delivered. “Uw website was een opluchting voor me. Mijn dochter van 16 draagt 65F en ik zelf 65G. Wij kunnen niets normaals vinden en als we iets vinden is het niet stevig genoeg. We zouden graag in het testpanel plaats nemen.” - Karin and Felicia M.
Lingerie brands such as Freya and Fantasie and stores and websites that offer these collections such as grotematen.nl, explicitly focus on women with large breasts and thereby are the major competitors. They offer pretty lingerie that often fits properly. However, plus sized lingerie is not always available and thereby quickly out of stock. Furthermore, customers are have to remain with the designs available in their size, because there are no alternatives from available global brands. Global brands are a competitor as they are able to adjust rapidly to changes in the market. However, global brands do not have special attention for large breasted women. And, hardly any global brand offers customized bra’s, or only offer customized bra’s for the most regular sizes. Packages are available that contain all the materials to compose a personal bra. As such packages are relatively expensive and the sewing takes a lot of time, onlya single misstep can have the effect that a creation doesn’t fit properly anymore. Individually tailored bras are unique items in which everything is chosen by the customer. These bras can be very pretty but rely on the seamstress. Such bras are very expensive, with a minimum price of € 150 euro per item. A positioning matrix of Double Dutch and her competitors can be found in the attached businessplan of Double Dutch Design. - Revenues will be gained from the sale of bras, complementary undergarments and accessories. - Women can fit the bras in the showroom stores and order them there and in the online shop. - After year 2, the collection will be complemented with bikini’s, bathing suits, body’s etc. - The co-creation with customers and partnerships with the existing lingerie stores are key elements of the business model. The revenue for year 1 will be € 192.000. See the financial attachments for more information. We already had 9000 unique visitors of our website from July - December 2013. (see the attached financial files for more info). We accomplished this with no paid-marketing tools.